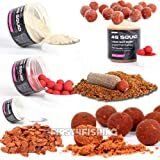 All the pulling power of Scopex Squid but with the addition of 4G Squid Salt Dust – a rock salt compound and fortified with vitamins, minerals and taste enhancers – the effect this addition has to an already world beating bait is evident as soon as you taste and smell it. Richer, more potent and bringing a more aggressive feeding response than ever before, 4G Squid is completed with genuine Haith’s Robin Red to combine all the very best characteristics of the squid mix success story. The final twist in the succession of Nashbait Squid Mixes, only now has an additive become available to improve the performance of the all time great Scopex Squid blend. 4G Squid embodies the famed elements of Scopex, Red Liver Oil and Sweetener, and with the addition of a remarkable and exclusive new taste enhancer and supplement takes the squid success story to yet another level. No-one could ever have imagined the impact of a single sample of a difficult to source, highly concentrated squid extract when Gary Bayes first ran trials with it as a boilie additive in the late 1970s. Soon to become the now legendary Nashbait Squid Extract it was to be the cornerstone of a family of record breaking base mixes and boilies that has left no part of the carp angling world untouched. This entry was posted in Carp Baits and tagged bait, BARBEL, Boilies, Carp, COARSE, Fishing, Nashbait, Range, Soaks, SQUID. Bookmark the permalink.